We’re accustomed to British Harper’s Bazaar delivering us more of the same with each issue, but the magazine has finally stepped away from the stately English manors it favors for its latest offering. For the July 2018 issue, Bazaar heads to Palm Beach, Florida for a sun-filled cover shoot with none other than Serena Williams. 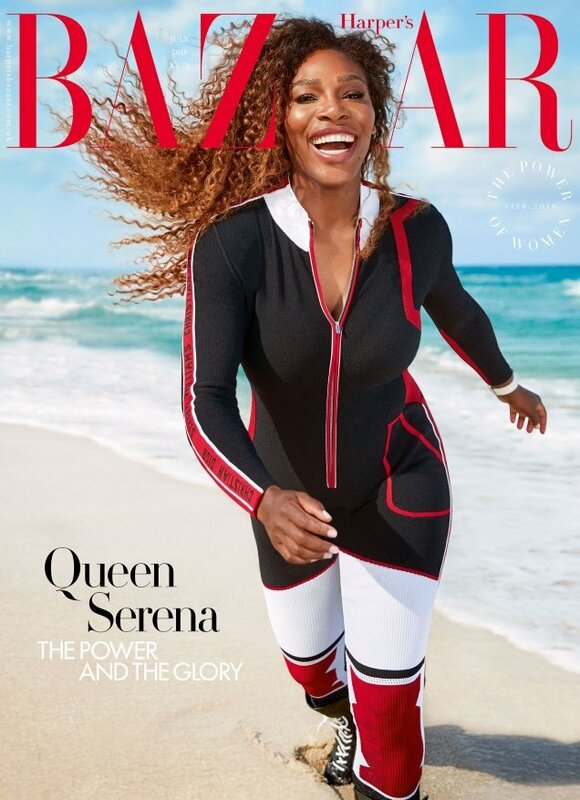 Photographed by Richard Phibbs and styled by Miranda Almond, Serena looks joyful and radiant at the beach on both the subscribers cover (below) and the regular newsstand alternative (after the jump). Members of our forums were pleasantly surprised. “Wow, not what I expected at all. It’s certainly season-appropriate, just hoped she would get the Harper’s hyper-feminine treatment. That would’ve been refreshing instead of this awkward jumpsuit. This mid-pose shot, which does look natural, isn’t really for me. Still, I’m shocked at her booking this title! The casting is certainly refreshing and I’ll still get it,” commented Benn98. “Yes, how wonderfully unexpected! Love that it looks like an image where they caught her in a moment, something we don’t often get from covers. Love it!” Miss Dalloway applauded. “My favorite cover of hers by far,” declared A.D.C. “Her body looks amazing on the newsstand cover; really refreshing cover for Bazaar UK,” echoed Fiercification. MON couldn’t have agreed more. “Stunning covers! The main cover is beautiful! Very inviting,” he raved. Check out Serena’s cover shoot in full and share your thoughts with us here.